In structural and functional protein studies, it is essential that the prepared protein does not aggregate, oligomerize, or degrade. With analytical SEC, tendency to aggregate and other size changes can be studied under different conditions, such as in storage stability analyses of biopharmaceuticals. In the two examples shown here, SuperdexTM 75 Increase 5/150 GL was used to monitor small changes in size homogeneity of two proteins stored under different conditions and over different time periods (weeks). The HPLC system used was equipped with an autosampler to allow analysis of many samples during long, unattended, overnight SEC runs. 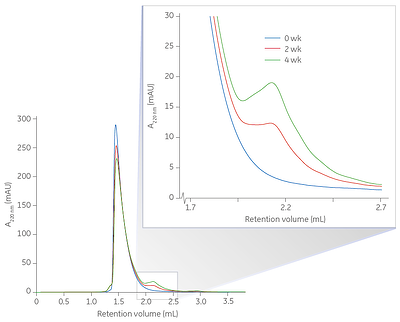 The first example demonstrates monitoring of size-homogeneity changes of proteins during storage (0, 2, and 4 wk) using Superdex 75 Increase 5/150 GL for rapid analyses of higher molecular weight variants. The area under the curves for the much larger main peaks decreased over time and corresponded to the area increase seen for the small fronting peaks. In this study the sample volume was 10 μL and the flow rate was 0.5 mL/min. 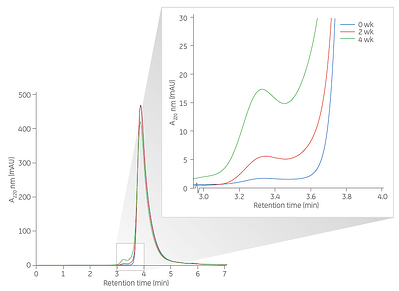 The lower figure illustrates another study monitoring size-homogeneity changes of proteins during storage (0, 2, and 4 wk) using Superdex 75 Increase 5/150 GL for rapid analyses of degraded products. The area under the curves for the much larger main peaks decreased over time and corresponded to the area increase seen for the small tailing peaks. The sample volume, flow rate and system were identical to those used in the first study.